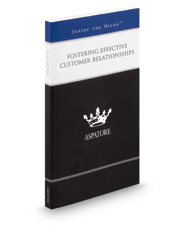 Fostering Effective Customer Relationships provides an authoritative, insider's perspective on acquiring and retaining customers in today's evolving business environment. Featuring articles by marketing executives from some of the top companies in North America, this book addresses key topics such as client communication strategies, the role of social media, and how to leverage customer engagement. Representing both business-to-business and business-to-consumer organizations, the executives share their views on forming strategic partnerships, encouraging loyalty, interpreting customer needs, and executing outstanding customer service. Additionally, these top leaders analyze some of the most common challenges marketers are likely to face when working with clients, customers, or partners, and they offer their approaches for maintaining and strengthening these relationships even under difficult circumstances. The different niches represented and the breadth of perspectives presented enable readers to get inside some of the leading marketing minds of today, as these top executives offer their thoughts on forming effective customer relationships that create significant competitive advantage for the business.